Posted on June 22, 2015 by David L. Hudson Jr.
On June 18, 2015, the U.S. Supreme Court invalidated an Arizona town’s ordinance that treated categories of signs quite differently – saying such differences violated the First Amendment. In doing so, the Court clarified a long-standing principle – that laws which discriminate against speech based on content are suspect and subject to a high degree of judicial scrutiny. This approach – sometimes called the content discrimination principle – holds that a law is “content-based” if it treats types of expression differently or subjects speakers to disparate levels of treatment, which the court held is impermissible. A law is “content-neutral” if it applies across the board to all types of expression. The sign ordinance of the Town of Gilbert was clearly content-based because it imposed more burdensome restrictions on ideological signs, political signs and especially temporary directional signs than other categories of signs. 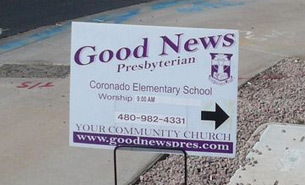 A local church needed directional signs as it often met at different schools around town. The town argued that its sign ordinance was content-neutral because its ordinance didn’t discriminate on the basis of viewpoint. In other words, the ordinance didn’t say a sign from Church X is okay but a sign from Church Y is not okay. The bottom line was that the Arizona town’s ordinance treated some signs much worse than other signs – clearly, content discrimination. Because the town’s ordinance was content-based, town officials had higher hurdles to clear. They had to show that its ordinance furthered a compelling (or very strong) interest in a very narrowly drawn manner. The town tried to come up with two compelling interests: aesthetics and traffic safety. The problem for the town, as Justice Thomas noted, was that there was no evidence that directional signs posed more of an aesthetics or traffic problem than other types of signs. David L. Hudson, Jr., is First Amendment Ombudsman for the Newseum Institute’s First Amendment Center. This entry was posted in News and tagged free speech, Religion, U.S. Supreme Court by David L. Hudson Jr.. Bookmark the permalink.